Hamachi kama is the collar of a yellowtail fish and is common in sushi. These fish are farmed in open-net pens, and the Monterey Bay Aquarium warns that hamachi kama might have a negative impact on the environment due to their high feed requirements and potential for spreading parasites. Despite these worries, hamachi kama is a healthy choice at Japanese restaurants because of its nutritional value. A 3.5-ounce serving of raw hamachi kama has 146 calories and 0 grams of carbohydrates. It has 23 grams of protein, or 46 percent of the daily value. Protein is necessary for maintaining lean muscle mass and other tissues in your body, and it can help you control your weight because it is a filling nutrient, according to the Harvard School of Public Health. The exact nutritional value of your meal with hamachi kama depends on how it is prepared. Hamachi kama has 5.2 grams of total fat, but only 1.3 grams of saturated fat in 3.5 ounces. Saturated fat raises levels of cholesterol in your blood and might increase your risk for heart disease, according to the 2010 Dietary Guidelines from the U.S. Department of Health and Human Services. The recommended daily maximum for healthy adults is to get no more than 10 percent of calories from saturated fat, or 22 grams per day on a 2,000-calorie diet. A serving of hamachi kama has 2 grams of monounsaturated fat and 1.4 grams of polyunsaturated fat. Each serving of plain hamachi kama has 420 milligrams of potassium and only 39 milligrams of sodium. A low-sodium, high-potassium diet can help you maintain normal blood pressure levels and lower your risk for heart disease and stroke. According to the 2010 Dietary Guidelines from the U.S. Department of Health and Human Services, healthy adults should get at least 4,700 milligrams of potassium and no more than 2,300 milligrams of sodium per day. 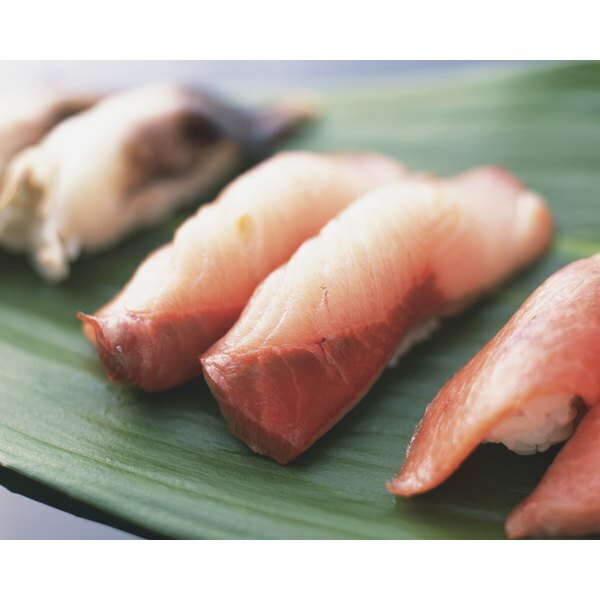 Yellowtail served with soy sauce or another salty condiment will be higher in sodium. Cholesterol is not an essential nutrient, and cholesterol from your food raises levels of cholesterol in your blood, according to the 2010 Dietary Guidelines from the U.S. Department of Health and Human Services. A 3.5-ounce serving of yellowtail has 55 milligrams of cholesterol, or 18 percent of the daily value. The fish has 1.3 micrograms of vitamin B-12, or 11 percent of the daily value, and 6.8 milligrams of niacin, or 34 percent of the daily value. Vitamin B-12 assists in the production of red blood cells, food metabolism and helps maintain a healthy central nervous system. Niacin also aids in production of blood cells and helps maintain healthy skin and digestive system.